Although this day was technically my second day in the country, the first was spent flying south along the mental motorways, so this morning felt like my real first introduction to Italy. I was awakened by the dusty smell of a summer morning and sunlight flooding in my wide open window casement. We were staying in this utterly gorgeous villa, Il Palazzetto, which was nestled – almost inaccessibly – in the hills between towns Gubbio and Costacciaro. Being so remote, the only sounds were the murmurings of small birds and the faint gurgling of the pool water, which I couldn’t wait to take a dip in! 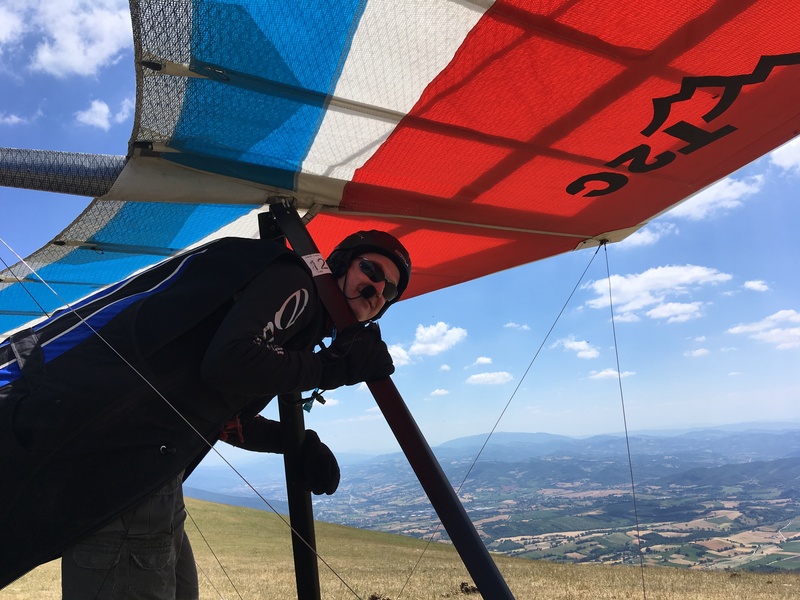 It took quite a lot to remind myself that I wasn’t just on holiday and remove myself from the stunning pool, so that I could go and get ready for a day of retrieving hang glider pilots. But equally, throughout the day I had to keep reminding myself that what I was doing was work! 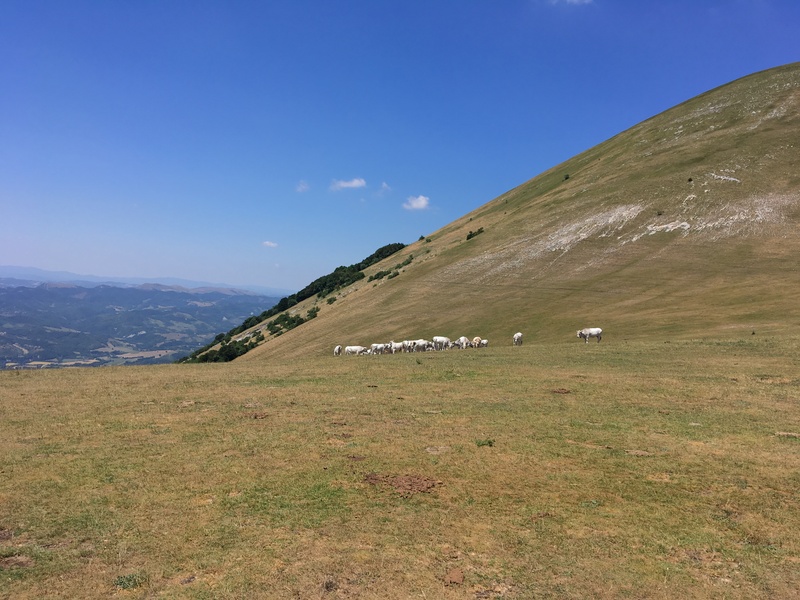 Driving up the magnificent Monte Cucco for the first time was unreal, it could barely keep my eyes on the road for the view of rolling hills and scattered terracotta towns opening up beneath us. Despite that, we made it to the top, where the gawking could be done safely. A fair bit of ‘hang-waiting’ took place while they guys rigged for their first flight. But as ever it provided a good opportunity to catch up on a little blogging! Cows on launch were a real first!! Pilot Darren ready to hit the skies! But soon they were away in the sky and I set off to deal with a very urgent issue – lunch. The matter was deliciously resolved a few hundred meters back down the hill at the quaint Ristorante La Valletta. I fumbled with my Italian but managed to successfully order some mushroom tortellini made with handpicked mushrooms from the mountain! It was SO GOOD, and cooked in oil which was wonderful for a little dairy-phobe like me! I didn’t realise how different fresh pasta was from the usual British-supermarket dried kind, it is so much richer and more filling. It made me realise how little I knew about good food, but at least I was in the right country to learn! Soon came some familiar radio crackle that made me leave my hilltop perch and start the winding drive down to retrieve the pilots from the bottom landing field. And of course, don’t forget one for yourself, watching pilots de-rig is thirsty work! As the sun slowly set on a successful first day of flying, our thoughts inevitably turned to the best way to end any first day in Italy, pizza of course!